Whether you want to increase application performance, simplify multi-cloud management, consolidate operations, or leverage emerging technologies, most digital initiatives start with modernizing core infrastructure. 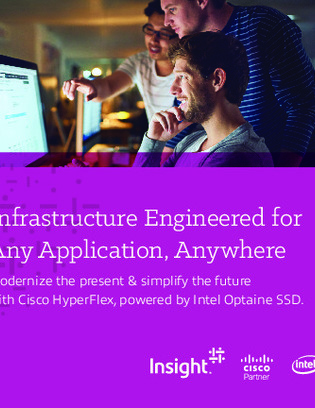 As such, this e-book reveals a hyper-converged infrastructure solution— Cisco HyperFlex, powered by Intel Xeon Scalable processors and Optane SSDs—capable of powering any workload, anywhere you need it. Not only does HyperFlex deliver consistent performance across your virtual environment to support critical workloads like Oracle and SQL, but it’s also the first complete HCI to feature fully integrated networking. View here to learn more.